I'm not a huge fan of Precious Moments, but they can be cute additions to some children's books. I was happy to read and review Precious Moments Little Book of Bible Stories because I am always interested in checking out new children's book options. The pictures in this book are cute. Sweet and gentle. Just what a person would expect from Precious Moments. This is something that seems like a good gift for a baby. Toddlers and older children may enjoy listening to the stories, too, though. The Bible stories seem pretty true to the Bible. The pictures are pretty cute. Each story has a Bible verse and reference that goes along with it. The size and make of this book is fun. I feel like the stories in this book are thrown together. It is as if any one of us was trying to quickly summarize the stories. Overall, I'm not a big fan of this book. 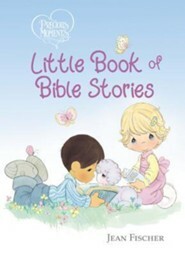 I give Precious Moments Little Book of Bible Stories 3 out of 5 stars.